It seems that a day cannot go by without an article in the MSM declaring that “Cuba is opening up to the world.” There´s a lot of tricky logic going in such statements, and this past Sunday´s Concert for Peace without Borders organized by Colombian pop star Juanes can help us to reflect on this a bit, and also to act to change United States restrictions on travel by Americans to Cuba. Being the music lover that I am, before anything else I have to comment: What a spectacular display it was! Well over a million people—half of Havana´s population according to Cuban press sources—filled the Plaza of the Revolution to see performances by Cuban artists living on the island and abroad whose work most epitomizes their homeland, such as Los Van Van, Orishas, Silvio Rodríguez, Yerba Buena, Carlos Varela and Amaury Pérez. Hats off to saxophonist and music director extraordinaire Juan Manuel Ceruto and an amazing ensemble that accompanied many of the Cubans, as well as their foreign guests, such as Luis Aute, Miguel Bosé, Olga Tañón and Danny Rivera, among others. It was great to see Cuban musicianship on display again here in the United States, if only via an online video stream provided by Univisión, something unheard of not so long ago. Latin America was definitely in the house in Havana. Performers from throughout the continent came together to celebrate their artistry, and to call for peace. The peace message may have seemed a little diffuse when the effort was proposed some months back. Then came the “death tweets” and assorted vitriol spewed against Juanes by a tiny sector of the south Florida Cuban–American community. As the concert approached, the singer realized the larger–than–life role he was taking on. In the end, he provided a bridge not only between the artists, but for all Cubans. 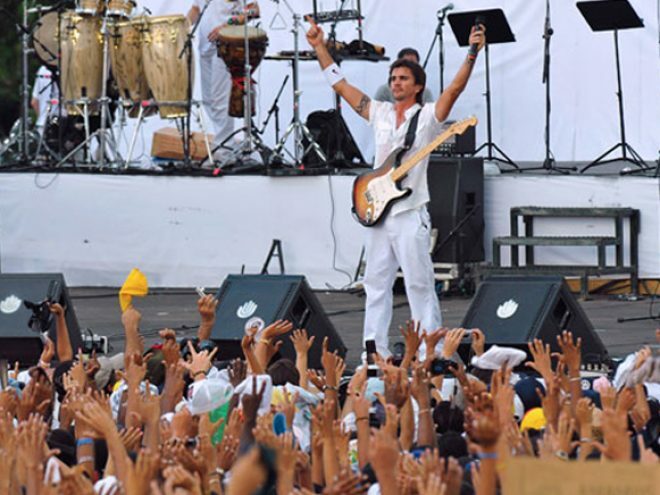 This concert was above all else about Cuba, framed within the context of Latin America. And today Cuba has stronger relations with Latin America than ever before in its history. Meanwhile, there are more than a few Cuban–Americans who identify with their homeland, their culture and their people, not as fifty–year–old artifacts but as they exist today in real time. The Concert for Peace without Borders added big exclamation points to these realities. For American observers and no doubt many of the artists and those in attendance, the five–hour festival begged the question as to the whereabouts of performing artists from the United States. At the risk of simplistic treatment, Cuba and the United States have a long and rich history of collaboration when it comes to music. Such was the case from the mid–19th century up until the early 1960s. During Jimmy Carter´s presidency in the late 1970s, musical collaboration in the form of Havana Jam and other projects took advantage of an opening and appeared to presage normalization of relations. Reagan all but shut the door on that hopeful period. The “People to People” era of Bill Clinton made the annual Havana International Jazz Festival part of the circuit for many U.S. musicians, and efforts such as 1999´s Music Bridges—a concept not unlike what Juanes brought us on Sunday—again raised expectations as travel to Cuba for Americans began to take on an air of normalcy for some. Then came George Bush, who by 2005 had implemented a policy characterized by what State Department officials termed “unprecedented disengagement” with Cuba. Another time of hope and high expectations came to an abrupt end. In spite of the rhetoric and actions of the Bush Administration, that same year Cuba attempted to pierce the wall. Following hurricane Katrina and the ensuing flood that devastated New Orleans, Cuba dedicated the 2005 Havana Jazz Festival to the music of New Orleans and invited performers from that cradle of North American culture to participate. Bush Administration officials made it clear that no one would be authorized to perform there. This mirrored the Bush refusal to even acknowledge Cuba´s offer to send hundreds of medical professionals to the Gulf Coast to assist with disaster relief efforts, an offer made even prior to Katrina making landfall. When thousands of us here relayed that message to the Bush Administration, the response was complete silence. The Obama Administration has taken some positive steps towards changing the situation. The most significant by far has been a blanket authorization to Cuban–Americans to travel to their homeland as often as they want, and to send to their families as much money as they may. There were many Cuban–Americans in the audience at Sunday´s concert, and there were a few Cuban–Americans on stage performing. But this does nothing for millions of Americans who have expressed the desire to travel to Cuba, if only they could do so without fear of punishment and harassment. This includes any number of musicians who would have been likely candidates to perform on Sunday and to share in the celebration with their brothers and sisters from Cuba, Latin America and elsewhere. And it is up to us to change this. Anyone who was moved by what they saw taking place at the Concert for Peace without Borders should be so moved to support the pending “Freedom to Travel to Cuba Act”—HR 874 in the House and its counterpart S 428 in the Senate—which are due to be considered by Congress this Fall. Take a moment on September 30 and join other Americans who will be contacting their elected officials that day. Ask them if they are supporting these critical bills, and if they are not, tell them why you believe that it is important that they do. Let us be inspired by the example of the Concert for Peace to take our own steps towards ending our own isolation from our island neighbor.